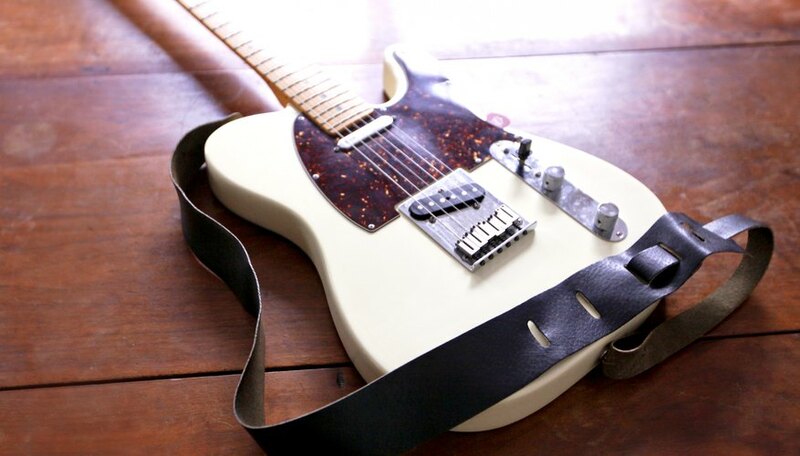 There’s nothing like the feel of a genuine leather guitar strap. 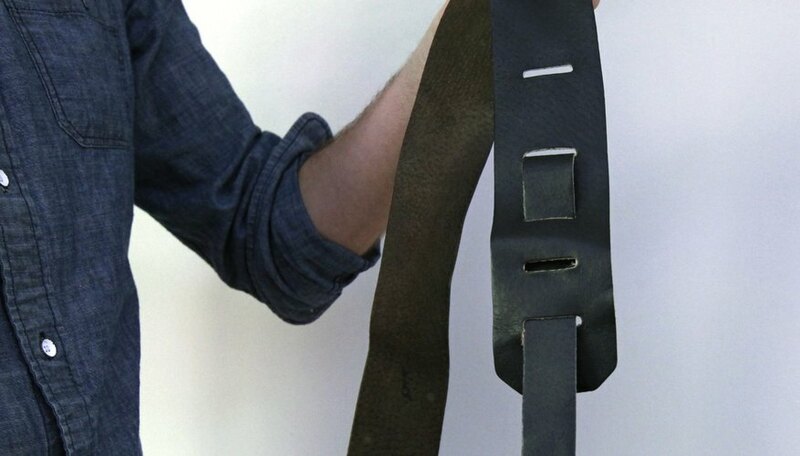 They are more expensive than straps made of other materials, but once you feel that leather over your shoulder, you’ll never go back to anything else. 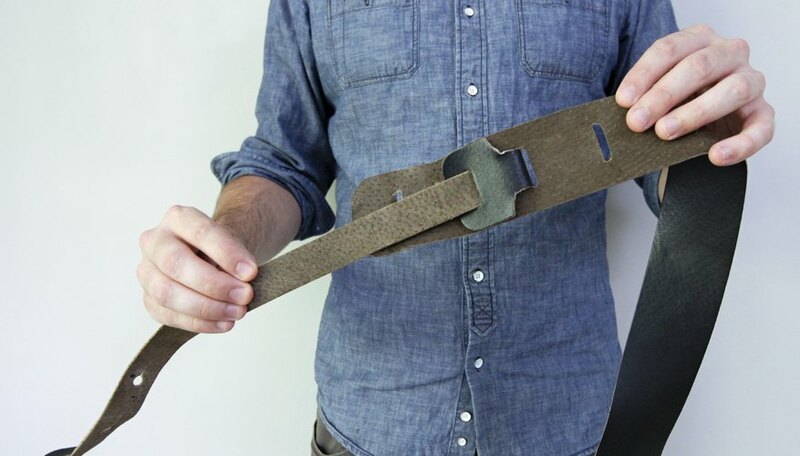 Leather straps conform to your shoulder, creating a custom fit to your body. But you have to get them adjusted right when they are new. 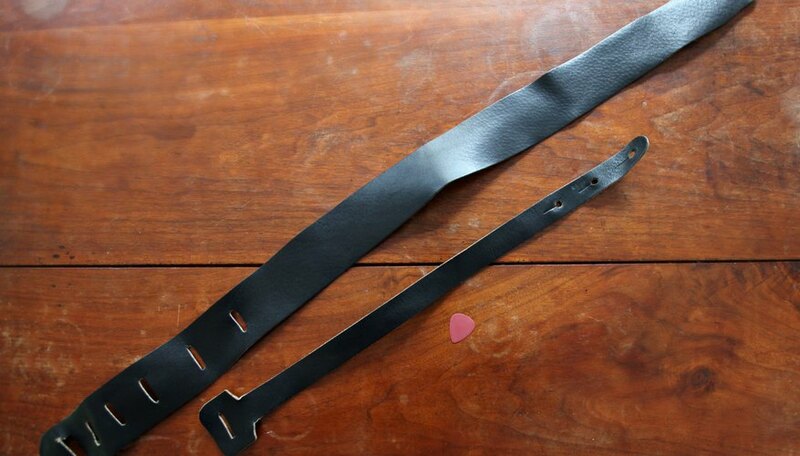 Once you get it right, a leather guitar strap will last a lifetime without needing another adjustment. Unhook all the tags and labels from the strap and discard them. You will have two pieces of leather: A wide piece approximately 3-by-36 inches long with 10 slots cut into the end, and one piece 1-by-22 inches long with a 2-inch-wide tab on the end with one slot cut into it. Thread the 1-inch piece of leather into the center slot of the wide piece, pulling it all the way through until the tab stops it from passing completely through. Pick up your guitar, and hold it by the neck with your left hand. Attach the 1-inch end of the strap to the knob at the bottom of the guitar. Attach the wide end of the strap to the knob on the top of the guitar body. 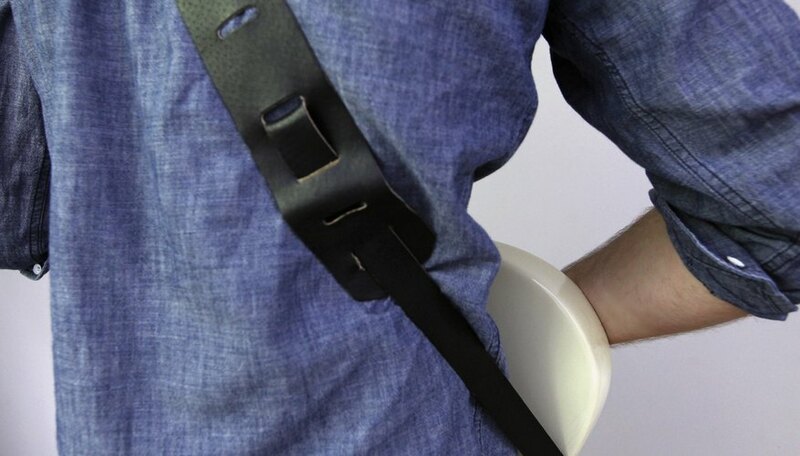 Put the strap over your head, letting the weight of the guitar settle the strap onto your shoulder. Rock the guitar slightly back and forth until you find the balance. Play the guitar. Your left hand should be straight out from your arm, with your fingers only being bent around the neck of the guitar. 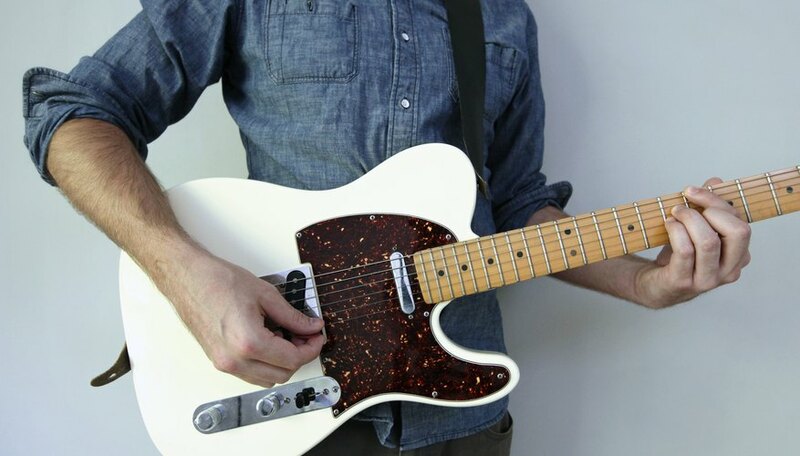 If your left wrist is bent upward, toward your body, the guitar is hanging to low. If your right wrist is bent upward, your guitar is too high. Play the guitar for a few minutes, and then decide if it’s too low or too high. When you decide, take off the strap, pull the 1-inch piece out, and thread it through the appropriate slots to raise or lower the guitar. 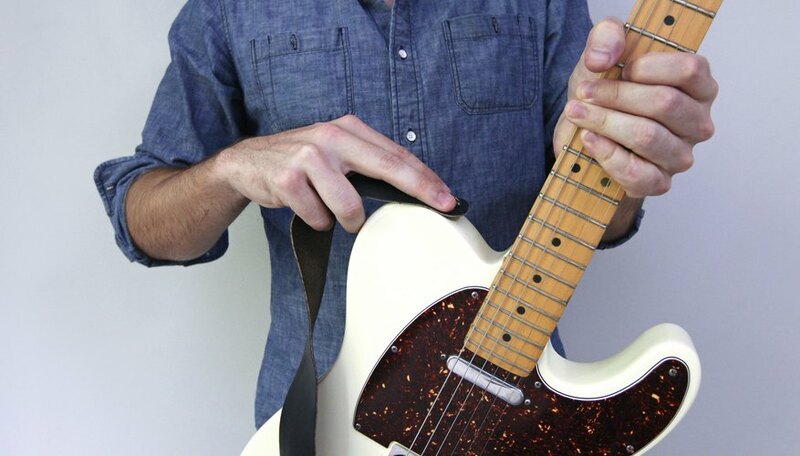 Try it on again until both your wrists are straight out when the guitar is in playing position over your shoulder. The strap is now ready to lock in. 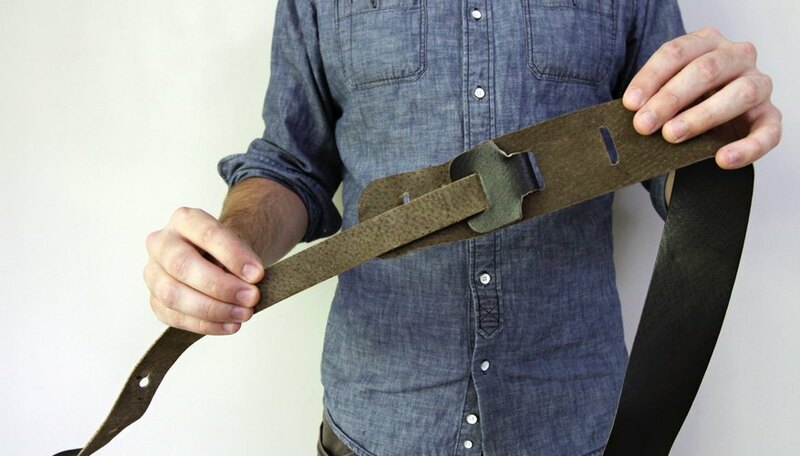 Lock in the strap position by threading the narrow end of the 1-inch strap through the slot directly beneath the slot that the 2-inch tab is passing through. As it emerges from the slot, pass it through the slot on the 2-inch tab. This creates a cinch. Pass the narrow end of the 1-inch piece through the bottom slot on the wide piece, and pull it tight. Hook the narrow end opposite the tab onto the guitar as before and the adjustment becomes permanent. 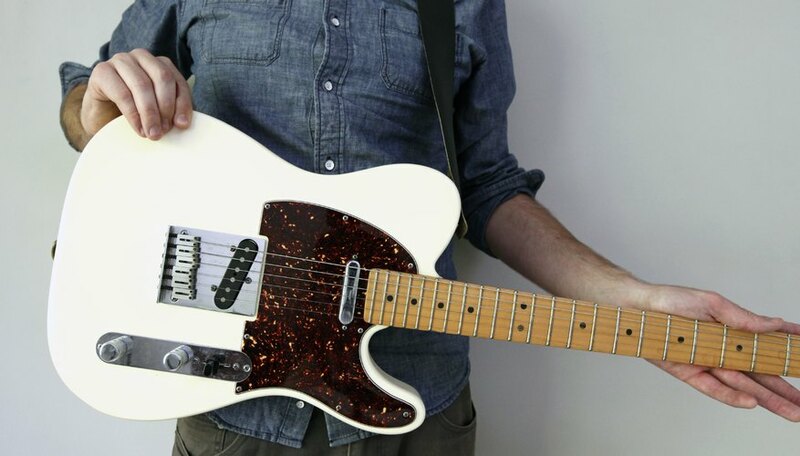 Don&rsquo;t be machismo by letting your guitar hang too low. Get comfortable. Serious guitar players know that there&rsquo;s no advantage in playing a guitar too low.